By Chris Williams: Former IBF/WBA/WBC welterweight and WBO light welterweight champion Zab Judah (37-6, 25 KOs) will continue with his comeback on May 1st, fighting B class opponent Jesus Rodriguez (19-3, 5 KOs) in a stay busy fight for Zab at the South Point Hotel Casino, in Las Vegas, Nevada. Judah could have been facing welterweight Matthew Hatton, the brother of Ricky Hatton, but according to reports Judah wasn’t offering much money for Hatton, so the younger, less talented of the Hatton brothers went in a different direction. Judah, 31, has to hope he can get by Rodriguez in an impressive fashion if Zab wants to continue to get future title shots. With four losses in the past three years, Judah has slipped to the 10th position in the World Boxing Council (WBC) welterweight division. In Judah’s last fight, he moved down to the light welterweight division to defeat Ernest Johnson by a 10-round decision. The fight against Rodriguez on May 1st will also be at light welterweight. Judah might as well stay at light welterweight, because he’s been beaten four times in world title bouts in the past three years at welterweight. It seems as if he’s too small for that weight division, and thought he initially found some success at that level four years ago, Judah has had rotten luck since then in defeats to Carlos Baldomir, Floyd Mayweather Jr., and Miguel Cotto and most recently to Joshua Clottey. Heavyweight David Haye is really counting on beating Wladimir Klitschko on June 20th, in hopes of one day soon defending his titles in Scotland. Why Haye would want to fight there of all places is a mystery to me, but it probably has something green involved in there somewhere. Why else would Haye want to bother taking a fight there? However, Haye seems to be having a little pipe dream, because even if Haye does beat Wladimir on the 20th, he still has to fight a rematch with either Wladimir or his brother Vitali Klitschko, along with another fight beyond that. Yeah, Haye may end up fighting in Scotland one day, but that’s likely to be far into the future and probably without any titles connected to it. Sounds like a good place to hide head in a hole after getting destroyed by Wladimir and his brother Vitali. If Haye gets beaten particularly bad by both brothers, Scotland wouldn’t be such as bad place to lay low. Former International Boxing Federation (IBF) light welterweight champion Paulie Malignaggi (25-2, 5 KOs) still licking his wounds from his humiliating 11th round stoppage loss to Ricky Hatton on November 22nd, 2008, will be trying to turn things around against journeyman Chris Fernandez (16-6-1, 5 KOs) on the undercard of the WBC super middleweight clash between champion Carl Froch and challenger Jermain Taylor on April 25th at the Foxwoods Resort Casino, in Mashantucket, Connecticut. Unfortunately for Malignaggi, 28, the fight won’t be shown on television, at least his fight won’t be. That’s got to hurt. 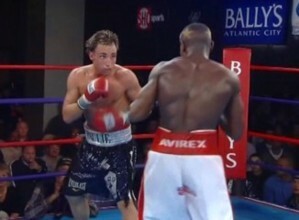 However, perhaps if Malignaggi had put in a better effort against Hatton in November it wouldn’t be the case. Malignaggi was dominated all 11 rounds of the fight and took a lot of punishment before the fight was eventually stopped in the 11th round with Hatton winning. Malignaggi is still ranked high in the light welterweight division, ranked number #7 by the IBF. However, there’s a lot of younger talent, with better power coming up in the ranks who would probably beat Malignaggi, fighters like Devon Alexander, Lamont Peterson, Mike Alvarado, Marcos Maidana and Victor Ortiz. Besides them, Zab Judah has returned to the division and Nate Campbell has moved up. Malignaggi would have his hands full with either of those two fighters. Malignaggi will probably be able to stick around the sport due to his big name, but he’ll have problems when he’s put in with the current champions or the abovementioned new comers to the light welterweight division. « Why Can’t Calzaghe Understand Froch’s Bitterness About Him?